Although mental health clinicians recognize codependency when they see it, the definition of codependency and who has it has been debated for decades. Experts agree that codependent patterns are passed on from one generation to another and that they can be unlearned — with help. Therapists and counselors see people with an array of symptoms, such as depression, anxiety, addiction, or intimacy and relationships issues. Clients are hurting and often believe the cause is something outside of themselves, like their partner, a troubled child, or a job. On closer examination, however, they start to see that, despite whatever else may be going on, their behavior and thinking patterns are adding to their problems — that is to say, their patterns are dysfunctional. These patterns have an addictive, compulsive quality, meaning that they take on a life of their own, despite their destructive consequences. The root problem is usually codependency. Along with comfort and pleasure, intimate relationships especially evoke all your hopes, fears, and yearnings. You want to feel secure and be loved, appreciated, and taken care of. Dependence upon those closest to you further magnifies your emotional needs and vulnerability to being rejected, judged, and seen at your worst. Codependency is a particular kind of dependence. It’s insidious and ­powerful. It robs you of joy, peace of mind, and the ability to have sustained, loving relationships. It affects your relationship with yourself and limits your flexibility and the natural flow of relationships with others, including giving and receiving love and support and the ability to communicate, compromise, and problem-solve. All the symptoms work together to not only deprive codependents of the benefits possible in relationships, but they also create problems that wouldn’t have otherwise existed. For example, shame and low self-esteem make you insecure, anxious, and dependent upon others’ acceptance and validation. You may feel uncomfortable being yourself and be hypersensitive to perceived criticism or abandonment (even where neither exists). You may attempt to control or manipulate people to maintain a relationship and to be liked. Some codependents require repeated reassurances or are afraid to be direct and honest, which is necessary for effective communication and real intimacy. Childhood shame and trauma conceal their real, core self, which they can’t access. Instead, codependents develop a persona in the world that reacts to others, to their own self-criticism, and to their imagined ideal of who they should be. To be acceptable to others and to themselves, you hide who you are and become who you aren’t. You may not even be aware of how self-critical you are but suffer the “tyranny of the should’s” — a phrase coined by psychoanalyst Karen Horney (pronounced “Horn-eye”). Even though you may not relate to this, it still operates beneath your conscious awareness. 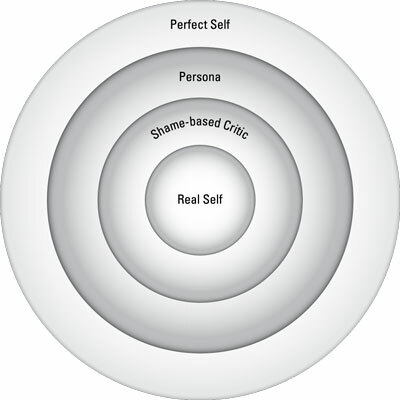 You may only be aware of your persona illustrated here and nothing on the inner circles. All relationships require boundaries. Love is not safe without them. Yet many codependents tolerate being treated without respect, because they lack self-worth. They don’t feel entitled to compliments, to be truly loved, or to set limits. They might do more than their share at work or in a relationship to earn acceptance, but they end up feeling unappreciated, used, or resentful. Shame can also cause codependents to deny or discount their feelings and needs, both to themselves and in their relationships. To cope, they sometimes disregard what’s actually happening, ruminate with worry or resentment, or finally explode. Their denial and confusion about their boundaries and responsibilities to themselves and to others create problems with intimacy and communication. Instead of bringing couples closer, frequently communication is avoided, is used to manipulate, or is highly reactive, leading to escalating conflict and/or withdrawal. Nothing gets resolved. They end up feeling trapped and unhappy because their symptoms paralyze them with fear of rejection and loneliness. The symptoms of codependency are all interwoven. They lead to painful emotions and self-sabotaging behaviors that produce negative feedback loops.